During its epic two week journey, Lostwithiel was fortunate to play host to the Man Engine event, which celebrated the 10th Anniversary of UNESCO World Heritage status for Devon & Cornwall Mining Heritage. Whilst a bit of a logistical challenge, it was nevertheless a tremendous success overall, and yet another major community achievement for Lostwithiel. The Museum helped to organise the ' Heritage Hub' where we were joined by John Peck, the official photographer for Wheal Jane tin mine before it closed in 1991. 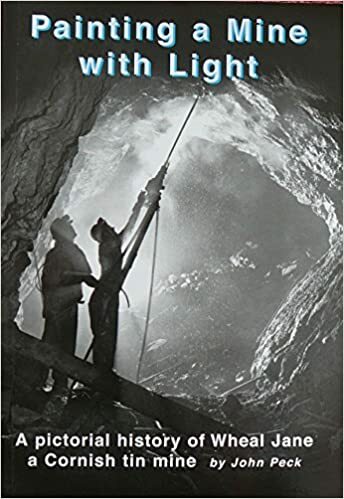 His book, 'Painting a Mine with Light' (a pictorial history of the mine) was on sale alongside some of his wonderful photographs. John's book has been kindly donated to the Museum by Lesley Bower, representing Lostwithiel's Transition group. You may not have recognised Rachel Parton in her 'Bal Maiden' costume, complete with the traditional 'gook' headgear painstakingly crafted by Rachel. 'Bal maiden' is the generic term for women or girls who were employed at the surface of the mine to reduce, separate & dress the ore - a filthy and dangerous task -hence the need for the 'gook' to help protect the eyes. Many thanks to Rachel who has kindly offered to donate a 'gook' to the Museum.